Elastic single stretch jersey featuring a floral jacquard pattern, with stretch piping and crochet trim across the neckline, straps and back. 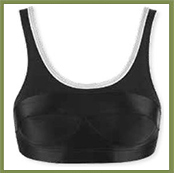 Specially designed and fabricated bras can be ordered with external breast prostheses. These compliment the use of a breast prosthesis by being designed in a way that the silicon prosthesis can be slipped into a pocket in the bra to keep it place and ensure that the fit looks and feels natural. They are available in many colours and designs and are also available in underwear sets for ladies who are fashion conscious. Variations are available to meet the requirements of many activities, such as sportwear and swimwear.